Peter Hanscomb's maiden ODI ton and Ashton Turner's extraordinary late surge helped Australia chase down a target of 359 with more than two overs remaining. Australia’s pre-World Cup preparations are going quite well, as it turns out. They were given no chance when they went 2-0 down but in Ranchi, they showed that they are no push-overs. But that victory was looking like a one-off on Sunday in Mohali, when Australia were reduced to 12/2 in the fourth over and then 271/5 in the 42nd while chasing a target of 360. On the first occasion, Usman Khawaja and Peter Handscomb took them out of troubled waters with the latter scoring his maiden ODI ton. And then, Ashton Turner made a meal out of Bhuvneshwar Kumar and Jasprit Bumrah in the death overs to pull off the unlikeliest of victories for Australia. India were pushed to their total of 358/9 largely due to a 115-ball 143 by Shikhar Dhawan which was also part of a mammoth 193-run opening stand with Rohit Sharma. After the players came back from the break, Bhuvneshwar Kumar opened the bowling. He ensured that Aaron Finch would not follow up on his good work in Ranchi as Bhuvneshwar cleaned up the Australian captain off the fourth ball. 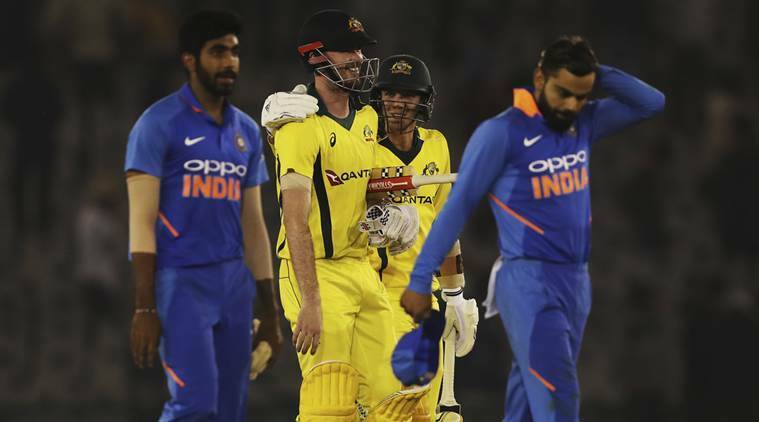 Jasprit Bumrah then got Shaun Marsh at which point it looked like Australia might bow out without giving much of a fight. Usman Khawaja and Peter Handscomb then went about rebuilding the innings. Both players saw out the pacers and then they started picking runs off Yuzvendra Chahal and Kuldeep Yadav. In that time, the batsmen crossed their individual half centuries and the partnership between them swelled beyond the 100-run mark. It was the return of Jasprit Bumrah that did the trick for India. He bowled the 34th over and forced Khawaja into a pull that he was he was late to. Kuldeep Yadav completed a good catch running in from fine leg to provide India the breakthrough. Khawaja and Handscomb’s partnership ended on 192 and the former was missed out on a second consecutive ton by nine runs. Handscomb then soldiered on and it looked Glenn Maxwell had come with the intent of taking the game away from India. However, both were eventually dismissed. Handscomb made 117 off 105 but India were on the ascendancy at the time when he returned to the pavilion. Australia needed 62 runs to win off the last six overs with Bumrah and Bhuvneshwar still having three overs each left to bowl. But Ashton Turner had other ideas. Shikhar Dhawan came roaring back to form with a 115-ball 143 that became the base for India’s dominance in the first innings. However, Australia did well to pull things back in the last seven overs, taking five wickets and conceding just 62 runs. Vijay Shankar’s cameo at the end is what pushed India beyond the 350-run mark. Dhawan and Rohit Sharma’s position at the top of the order was slowly starting to come under a cloud of doubt due to the pair’s recent run of low scores. They, however, proved the naysayers wrong by smashing a 193-run opening stand. Both players were in their 90s when Rohit was dismissed. Dhawan, however, carried on and crossed over into the three-digit area. He went on to flog the Australian bowlers for 18 balls after that before falling to Cummins. Cummins was to be the scourge of the Indian batsmen throughout the innings after than and ended up picking up a five-wicket haul. A victory for India in this match would seal a series-win for them.